This is stating the obvious and doesn’t suggest any sort of sinister grade inflation. The U.S. economic recovery that began 10 years ago has pushed the unemployment rate to about its lowest in half a century. Average hourly earnings are rising at the fastest pace since the recession ended. It follows that a number of Americans who were previously jobless now bring in a steady income and have higher credit scores. That, in turn, affords them greater access to credit. So, what’s the problem? Cris deRitis, deputy chief economist at Moody’s, says he’s concerned about “smaller, less sophisticated firms that lend to people with poor credit histories.” He added that “car loans, retail credit cards and personal loans handed out online are the most exposed to the inflated scores.” Tempkin notes that there’s about $400 billion of that kind of debt outstanding, with a quarter of it bundled into securities that investors now hold. I realize companies that cater to weaker borrowers can serve a vital function. Some subprime borrowers simply need a lifeline to get their finances back in order. JPMorgan Chase & Co. Chief Executive Officer Jamie Dimon even said in congressional testimony this week that when it comes to mortgages, loosening constraints on lending to people with low incomes or prior defaults could single-handedly boost U.S. economic growth by 0.2 percent. Still, forgive me for not shedding a tear for firms that don’t look beyond FICO scores, or for investors who snapped up high-yielding asset-backed securities. The hand-wringing over FICO scores feels very much the same. 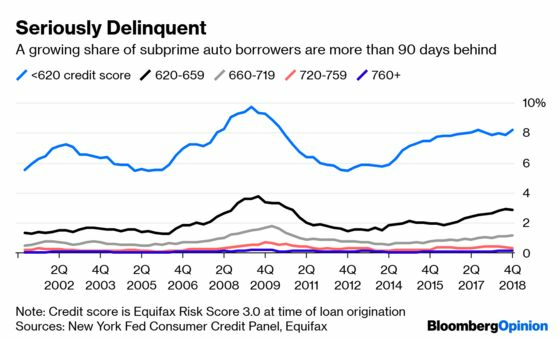 Goldman attributes the growing number of delinquent auto loans to the general increase in credit scores. But again, it comes back to who’s doing the lending. Large banks certainly use more than just FICO scores to determine whom they choose to underwrite and at what terms. There’s a reason for that, and it probably has precisely to do with scores looking rosy during good economic times. It’s not hard to come up with ways to alleviate concerns about elevated FICO scores. Lenders can require a broader range of information before extending credit, or they can simply bump up their FICO thresholds to account for the prolonged business cycle. The same goes for investors in asset-backed securities. They could easily just be more selective in what they purchase. But with the Federal Reserve no longer raising interest rates and the reach for yield back in style, that doesn’t seem likely. If the bundles of loans turn bad, they’ll have no one to blame but themselves. It’s tempting to look for signs of stress now that the U.S. economy is on the verge of the longest expansion in history. And it’s true that private-label credit cards and online loans are seeing an uptick in missed payments. But just as the inverted yield curve served as a reminder that all business cycles must end (though not necessarily imminently), these delinquent payments are simply a call for lenders and investors to get smarter.